Adjacent to the DeWaters Education Center, between posts No. 47 and No. 48, is a sign announcing you are on the “Edge of the Woods Trail.” It’s unclear what route the sign is actually marking but the name is very appropriate for this hike in For-Mar Nature Preserve and Arboretum. This 2-mile route, a combination of a dozen short segments, leads you through the most interesting sections of the preserve; the wooded floodplain of Kearsley Creek and the collection of ponds and wetlands in the heart of the park. Along the way you pass a wetland observation tower, a historic windmill and, if it’s Sunday, can stop and view the Corydon E. Foote Bird Museum. For much of this hike you are either in the woods or skirting the edge of them with fields on one side and trees on the other. And in such a setting you have as good a chance to spot wildlife here as anywhere in the preserve. The hike begins in the main parking area at For-Mar, reached from Genesee Road but within a 100 yards you reach Forbes and Martha Merkley Visitor Center, where you can fill the water bottles, grab a trail map or give the kids a quick natural history lesson before hitting the trail. The Merkley Visitors Center is open Wednesday through Sunday from 8 a.m. to 5 p.m. The Foote Bird Museum is open every Sunday from 2-4 p.m. 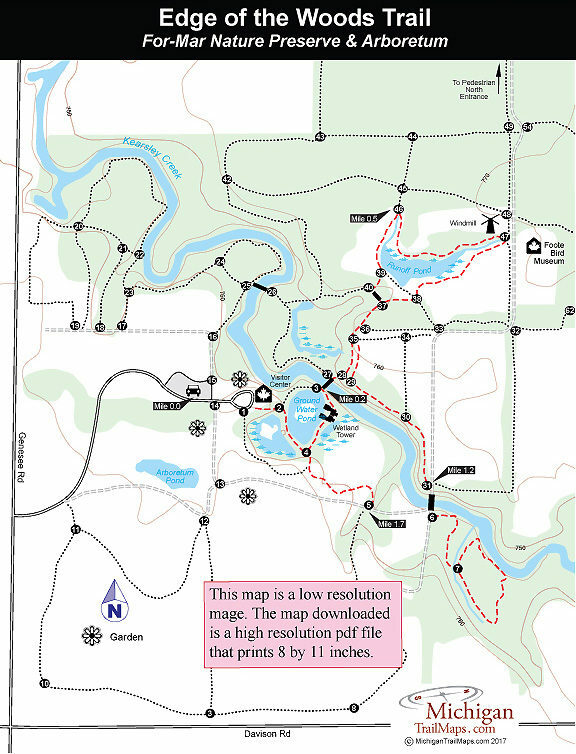 In the spring it’s a good idea to call the visitor center (810-789-8567) is advance to make sure the trails are not flooded and all the bridges are intact. In May and June, pack along bug repellent. From the parking area follow the sidewalk to Merkley Visitors Center and then head right around the building to a wood chip path that heads into the woods. Within a few steps you reach post No.2 where you head right again. You follow a dry path between a pair of wetland ponds, passing post No. 4 and then the Wetland Observation Tower overlooking one of them, the Ground Water Pond. From the top you can look for wildlife in the three ponds while listening to frogs bellow all around you. The trail arrives at post No. 3 at Mile 0.2 where there is a dock on Ground Water Pond and a trail that leads right to a large swinging bridge over Kearsley Creek. Once across follow posts No. 27, No. 28, No. 35 and No. 37 to remain the woods and reach at another bridge, this one fairly small. On the other side is post no. 40 where you head right and then left at post No. 39 to skirt around Runoff Pond. At Mile 0.5 is post No. 46 on the edge of a large field where you can easily spot posts No. 45 and No. 44 along a trail that crosses it. You don’t. Instead swing sharply to right and follow a mowed lane that continues to skirt Runoff Pond. At post No. 47 you arrive at the historic windmill and well that was used by the Merkleys on their dairy farm in the 1930s. Nearby is a gravel road and across it you can spot the DeWaters Education Center, home to the Corydon E. Foote Bird Museum, an ideal place for a break with kids. From post No. 47 head towards post No. 38 along the south side of Runoff Pond where fields are to the left of you and woods to the right. The post is reached at Mile 0.9 just after passing a bench overlooking the pond. At this point you backtrack an earlier section to reach post No. 28 then head east (left) to follow a low wooded bluff above Kearsley Creek. 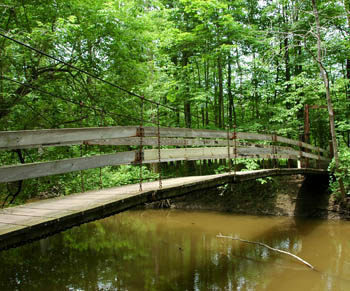 At Mile 1.2 you break out of the woods at the gravel road and follow it south to cross the creek on the road bridge. On the other side is post No. 6, a junction where a 0.3-mile side loop continues to follow Kearsley Creek in the woods before returning to the gravel road. The hike ends by following the road west from post No. 6 and picking up the trail at post No. 5 at Mile 1.75. Head north (right) to post No. 4 and backtrack the first section around Ground Water Pond to quickly arrive at Merkley Visitors Center. The Merkley Visitors Center features displays relating to the nature preserve and arboretum with many of them hands-on exhibits designed for children along with restrooms, drinking water and a gift shop. Also at For-Mar is the Foote Bird Museum in the DeWaters Education Center, a barrier-free, paved trail next to the museum and a picnic area. There are no fees for visiting the nature centers or using the trails at For-Mar. The trails are open Wednesday through Sunday from 8 a.m. to sunset and the Merkley Visitors Center is open Wednesday through Sunday from 8 a.m. to 5 p.m. The Foote Bird Museum is open every Sunday from 2-4 p.m.
From I-69, east of Flint, depart at exit 141 and head north on Belsay Road. Within a mile of the I-69 exit turn west on Davison Road and then north on Genesee Road where the main entrance is clearly marked on the east side of the road. Contact the For-Mar Nature Preserve (810-789-8567) or the Genesee County Parks and Recreation Commission (810-736-7100; www.geneseecountyparks.org).